As if it had been a Christian soul, 65 We hail'd it in God's name. Simile comparing the Albatross with Christianity and a good omen of God. It reinforces the epigraph at the beginning which basically sums up to "I can easily believe.". Coleridge is showing not only that sailors are a superstitious group but also that when people are in a crisis it is easier to have faith in the seemingly unlikely. This sentence shifts from the past to the present of this piece. Coleridge uses it to show the disorientation of the Mariner. It serves as a focal point for the reader to be able to recognize how affected he is by the traumatic experience that the listener has to interrupt the Mariner's rambling so he can proceed with what happened to the bird. The holy Mother here refers to the Virgin Mary, mother of Jesus Christ, who is sometimes known as the Queen of heaven. By her grade, the Mariner was refreshed with rain. This stanza seems to relate back to the South Pole, which we already know is one of the coldest places on the earth. The gloss below describes it as "The land of ice, and of fearful sounds, where no living thing was to be seen." In this stanza, the comparison of ice and emerald is really interesting. It is the perfect juxtaposition of the terrifying weather at the South Pole and the beauty of an emerald. "The ship drawn by a storm toward the South Pole." The South Pole is the southernmost point on this earth and it is located on the continent of Antarctica. It is one of the coldest places on the earth. This gloss helps to explain how rough and powerful the waters near the South Pole are, because the storm and the waters were drawing the boat to the South Pole. "South Pole." National Geographic Education. 1 Feb. 2011. Web. 9 Oct. 2015. http://education.nationalgeographic.com/encyclopedia/south-pole/. It raised my hair, it fann'd my cheek Like a meadow-gale of spring— It mingled strangely with my fears, Yet it felt like a welcoming. Coleridge uses a simile here to compare a seemingly supernatural wind with that of the wind in a meadow during the spring. This contrasts with where the Mariner is during these lines, since he is stuck on a ship at sea with a dead crew. To bring a meadow during spring into the poem connects this wind with the idea of something joyous and possibly of rebirth. After the Mariner's ordeals, he becomes a changed man and is more religious, which could be interpreted as a type of rebirth. Also the fact that it "felt like a welcoming" is also juxtaposed with the supernatural and frightening experiences the Mariner has. The harbour-bay was clear as glass, So smoothly it was strewn! And on the bay the moonlight lay, 475 And the shadow of the Moon. The rock shone bright, the kirk no less That stands above the rock: The moonlight steep'd in silentness The steady weathercock. 480 The angelic spirits leave the dead bodies, And the bay was white with silent light Till rising from the same, Full many shapes, that shadows were, In crimson colours came. These twelve lines are not in their original orientation. An earlier edition of the poem published in 1798 have a number of lines included between each set of four lines. The lines that have been omitted here describe the reanimated bodies moving towards the mast of the ship and raising their right arms. Throughout lines 481-502 of the 1798 version, they are described as red shadows, their outstretched arms like torches, and their eyes glittering in the red light. Upon watching this, the Mariner is fearful and turns away and prays. In this later version of the poem, the bodies are not described in great detail like the 1798 version. This omission makes the scene less frightening since it only describes the moonlight and the angelic spirits leaving the dead bodies. The lonesome Spirit from the South Pole carries on the ship as far as the Line, in obedience to the angelic troop, but still requireth vengeance. Here the text in the margin, or the gloss, points out that the spirit from the South Pole is forced by angelic spirits to move the ship. The ship is said to move to the Line, which is the equator, though previously the ship had been sailing southward. Lines 379 to 384 only say that the ship had been sailing on it's own and then a supernatural force takes over and propels the ship backwards and forwards in the next lines, but there is no clear indication as to where the ship is going. The gloss, however, provides a definite direction and it seems that Coleridge perhaps wanted to clarify this. The gloss also mentions that the spirit wants vengeance for the death of the Albatross. This could indicate the curse placed on the Mariner in which he has to tell his tale to the people he meets. Here the Mariners crew begins to agree with his choice to shoot the bird, while in the previous verse on line 95 they cursed him for his decision. The fickleness of the crew is reflected in the conditions in which they sail: good times means the Mariner is right, bad times means the Mariner is wrong. Coleridge may be trying to paint the Mariner's actions in a neutral light, showing that this situation is only terrible or joyous because man deems it that way. Coleridge wants the reader to question whether or not the actual slaying of the albatross has any real life consequences. And now there came both mist and snow,<br> And it grew wondrous cold:<br> And ice, mast-high, came floating by,<br> As green as emerald. Green was the color of the devil in the middle ages and as Coleridge had a proclivity for the medieval in this work, he used the mist and ice as foreboding metaphors to suggest the ship is bound for a demonic realm much like the voyage in The Demon Lover. Nozedar, Adele. The Element Encyclopedia of Secret Signs and Symbols. Hong Kong: Harper Element, 2008. Print. Vespers is the sunset prayer in many christian denominations. This is as "Gothic" as it gets. A mysterious bird following a damned voyage driven south (hell) with white fog and lunar radiance with a reference to late night supplications. A moody and portentous rhyme that shouldn't be overlooked. 1798 ed lines 177-185:And are these two all, all the crew,<br> That woman and her fleshless Pheere?His bones were black with many a crack,<br> All black and bare, I ween;<br> Jet-black and bare, save where with rust<br> Of mouldy damps and charnel crust<br> They're patch'd with purple and green. A strong contrast can bees seen here between the two versions of the poem. In the first edition we get a more ghastly death specter without the gloss. The "charnel crust" evokes gruesome imagery as we can see the flesh rotting from the ribs of the phantasm. The second edition uses the gloss to briefly describe the scene; perhaps Coleridge felt it was too graphic to keep such horrors in the stanza. On a sailing ship, months can go by without a change of routine. Seeing signs of life breaks up the monotony, which can be a huge boost for morale. It is normal for seabirds to follow ships to pick at food scraps on the ship or roost in high in the masts and rigging. However, these animals can also be useful tools for experienced sea faring travelers too. Animals can point to land or easy food sources, because they seek it out on instinct. In the poem, the Albatross notices the Mariner's ship, which is stuck in the ice, through the Arctic fog and comes to investigate. Upon the arrival of the bird, the wind began to pick up and allowed the boat to be free of the ice as if it had some sort of control over it. However, it is interesting to note that Coleridge added this gloss (for lines 71-74) to say that the Albatross is "leading" the ship through the ice instead of just following the ship blindly. Leading how? Well if the Albatross is looking for fresh food, it would have to fly over open water. That would mean the was ice thinned or had not formed in the direction it traveled. So the bird would have never shown up if it were not for thin ice, so the Mariner and his crew led the boat away from the thicker freezing ice and back out to open water that the Albatross would naturally. Simply put, the curious bird had become an effective navigation tool. "Albatross." A Dictionary of Literary Symbols. Michael Ferber. Cambridge: Cambridge University Press, 2007. Credo Reference. Web. 5 Oct 2015. 'The Sun now rose upon the right: Out of the sea came he, Still hid in mist, and on the left 85 Went down into the sea. Knowing that the sun rises in the East and sets in the West, we can determine that the ship is now traveling North, as the sun rises on the right and later "went down into the sea" on the left. 'I fear thee, ancient Mariner! 225 I fear thy skinny hand! And thou art long, and lank, and brown, As is the ribb'd sea-sand. I fear thee and thy glittering eye, And thy skinny hand so brown. '— 230But the ancient Mariner assureth him of his bodily life, and proceedeth to relate his horrible penance. 'Fear not, fear not, thou Wedding-Guest! This body dropt not down. Here we see a shift in speaker. In lines 225-230 the Wedding-Guest is addressing the Mariner. He is concerned that the Mariner is actually a spirit (as the gloss clarifies) because of his appearance. The speaker shifts back to the Mariner in line 231 when the Mariner assures the Wedding-Guest that he is, indeed, still in his bodily life. This small digression shows how the Wedding-Guest is drawn in by the tone of horror and the supernatural beings/events in the Mariner's tale. 'God save thee, ancient Mariner! From the fiends, that plague thee thus!— 80 Why look'st thou so? '—'With my crossbow I shot the Albatross. This is where the Mariner seals the fate of his crew, as well as himself, through a massive turning point and irrational act. He shoots down the Albatross, the guide that led them out of the ice and that which was such a happy influence on the crew. The question is why? Had the brilliance of the bird garnered the envy of the Mariner? Perhaps the Mariner saw the bird as no longer useful. Either way, this marks the decent of the expedition bringing the wrath of nature upon him, which also then literally begins weighing him down when the crew forces him to wear the bird around his neck. As a side note, Gustave Dore was an artist that made extremely detailed wood carvings, many being of different literary works. The ones for "Rime of the Ancient Mariner" are especially telling, so please take a look at this beautiful wood engraving depicting the catalyzing moment of the poem. I would also highly suggest looking at the others in the collection. "Gustave Doré Art Prints: Illustrations to The Rime of the Ancient Mariner." Gustave Dore. ARTSY CRAFTSY, n.d. Web. 05 Oct. 2015. "I Shot the Albatross, Gustave Dore Art Print." I Shot the Albatross, Gustave Dore Art Print. ARTSY CRAFTSY, n.d. Web. 05 Oct. 2015. As if through a dungeon-grate he peer'd With broad and burning face. Coleridge uses a metaphor here to further describe the transparency of the ghostly ship. His use of the term "dungeon-grate" makes the appearance of the ship more ominous and foreshadows the chilling encounter the Mariner has with the supernatural. These lines also personify the sun, like the sun being a prisoner looking out from the bars of a dungeon. The line in quotations is the wedding guest interrupting the Mariner and saying that he is afraid. The Mariner responds to him in the next line by telling him to be calm. The shift of the speaker allows the reader to recall that the Mariner is at a wedding and telling this story to a wedding guest. In other words, this is a story within a story. In lines 60-65, the same pattern is said. "The ice was here, the ice was there, the ice was all around: It crack'd and growl'd, and roar'd and howl'd, Like noises in a swound!" In those lines, the Albatross then comes and breaks the ice and rescues the Ancient Mariner and his fellow sailors. However, in lines 119-122, there is water everywhere, and the Albatross is now coming again, but this time in spirit and with revenge. This is when the tale starts to speak of supernatural things, and this is when the sailor's superstitions tell them that something bad is going to happen. Michael Psellus is known as the "Platonic Constantinopolitan." He was a Constantinople native who was a great advocate of Platonic philosophy. Platonic philosophy is the philosophy of unknown and abstract objects. In Platonic philosophy, the common belief is that these abstract objects exist, or "live" in a different dimension or realm. This is most likely a reference to the sailor's superstition of the "death-fires" that are foreshadowing bad events to come. Possibly, the Albatross is the spirit that is following the sailors and is bringing back luck upon the sailors. Works Cited "Michael Psellus." Encyclopedia Britannica Online. Encyclopedia Britannica, n.d. Web. 04 Oct. 2015. An ancient Mariner meeteth three gallants bidden to a wedding feast, and detaineth one. The gloss, or text in the margins, here summarizes in plainer words the specifics of the first stanza. These annotations by Coleridge, which continue throughout the poem, were not in the original printing of the poem. This added level of clarification might be because of public reception and criticism. Many were critical of the initial printing for the obtuse and archaic spelling and language, including William Wordsworth. He wrote to Joseph Cottle in 1799, saying, "From what I can gather it seems that The Ancyent Marinere has, on the whole, been an injury to the volume ; I mean that the old words and the strangeness of it have deterred readers from going on. If the volume should come to a second edition, I would put in its place some little things which would be more likely to suit the common taste." Click on 'Full Text' off to the side to view a plain text file. The Sun came up upon the left, 25 Out of the sea came he! And he shone bright, and on the right Went down into the sea. A poetic way to describe the ship's direction. Knowing that the sun rises due East and sets due West, one can discern that the sea vessel is traveling south. The Line refers to the equator. The equator is an imaginary line of latitude dividing the Earth into Northern and Southern hemispheres. Here, the gloss is providing clarification, making sure that the direction of the ship is clear ("the ship sailed southward"). Chesworth, Nancy. "Equator." The Encyclopedia of Tourism and Recreation in Marine Environments. Ed. Michael Luck. Oxford: CABI, 2008. Credo Reference. Web. 4 Oct 2015. And now there came both mist and snow. The Land of ice, and fearful sounds, where no living thing was to be seen. This line and proceeding gloss recalls Niflheim, the Norse land of the dead which features mist, cold, the cacophony of damned spirits and a phosphorescent sheen. The vikings told stories of doomed voyages with descriptions of mist, cold, and loss. By combining underworld imagery with a sort of hallucinatory vision, Coleridge draws an intriguing parallel to the dark tradition of viking nautical myths. It is the Hermit good! He'll shrieve my soul. Ruiz, Teofilo F. "The Terror of History: Mystics, Heretics, and Witches in the Western Tradition." The Teaching Company. 2002. DVD. Lecture. Coleridge's use of the Albatross is really interesting here and throughout the poem. An Albatross is "a large white ocean bird that has very long wings". (http://www.merriam-webster.com/dictionary/albatross). National Geographic writes about the significance of the Albatross in the poem. "Albatrosses feed primarily on squid or schooling fish, but are familiar to mariners because they sometimes follow ships in hopes of dining on handouts or garbage. Albatrosses have a special place in maritime lore and superstition, most memorably evoked in Samuel Taylor Coleridge's The Rime of the Ancient Mariner." (http://animals.nationalgeographic.com/animals/birds/albatross/). Merriam-Webster. Merriam-Webster. Web. 3 Oct. 2015. "Albatrosses, Albatross Pictures, Albatross Facts - National Geographic." National Geographic. Web. 3 Oct. 2015. It is interesting to note that the earlier edition of this poem was titled "The Rime of the Ancyent Marinere in Seven Parts". This earlier edition was published in 1798. This later edition, "The Rime of the Ancient Mariner", was published in 1817. In the earlier edition, Coleridge used a lot of old-fashioned spelling, even for the time period that he was writing in. In the later edition, he updated his spelling and added or removed various stanzas throughout the poem. He also changed some verb tenses in the later edition. This makes one wonder why Coleridge made so many changes to an already fantastic poem. Hanging the bird around his neck and relating it to the cross is a clear mockery of the innocent bird. I feel that he is being related to jesus, who was also mocked and killed, while only bringing a good message, just like the Albatross. To mock the Albatross in this fashion is giving its killer a sense of no wrong doing as others join in. This is also how the crucifixion of Jesus played out, with plenty of mockery. Ne dim ne red, like God's own head, The glorious Sun uprist: Then all averr'd, I had kill'd the Bird That brought the fog and mist. T'was right, said they, such birds to slay That bring the fog and mist. Through confusion and worry they've deemed this bird that is meant to be a sign of good luck and fortune to be a bringer of fog and mist. Through this unanimous condemnation of the bird, they have justified, to themselves, its killing. I feel that this isn't entirely sincere, and they are stating this fact because they are indeed scared that they may have botched any chances they had for good fortune, and would like to feel better about what has been done. This ties in with the religious connotations a little bit later in the poem. "The souls did from their bodies fly—<br> They fled to bliss or woe!<br> And every soul, it pass'd me by<br> Like the whizz of my crossbow!' "
"And I had done an hellish thing,<br> And it would work 'em woe:<br> For all averr'd, I had kill'd the bird<br> That made the breeze to blow.<br> Ah wretch! said they, the bird to slay,<br> That made the breeze to blow! " This describes the scene of a crucifixion. Groups such as the Persians, Jews, Carthaginians, and Romans practiced this form of capital punishment from around the 6th century BCE to the 4th century CE. The process involves nailing or tying the subject to a wooden cross, usually shaped like a T.
This punishment is commonly connected with the story of the crucifixion of Jesus Christ. Deemed a false Messiah by his fellow Jews, he was adorned with a crown of thorns and nailed to a cross by a nail through each hand, as well as one nail through the feet. He died, was buried, and, on the third day of his death, was miraculously resurrected back to life. Blake plays with this imagery as the man and woman in his poem transition again and again from young to old and old to young. Works cited: "Crucifixion." Britannica Concise Encyclopedia. Encyclopaedia Britannica. Chicago: Encyclopedia Britannica, 2014.Credo Reference. Web. 23 Sep 2015. "Crucifixion." The Columbia Encyclopedia. Columbia University and Paul Lagasse. New York: Columbia University Press, 2015. Credo Reference. Web. 23 Sep 2015. "Crucifixion." The New Dictionary of Cultural Literacy, Houghton Mifflin. E.D. Hirsch, JosephF. Kett, and JamesS. Trefil. Boston: Houghton Mifflin, 2002. Credo Reference. Web. 23 Sep 2015. Did then the bold Slave rear at last the Sword Of Vengeance? This line refers back to the previous sonnet, in which a slave weeps bitter tears for the loss of his life and family. Due to the wrongs wrought upon this poor soul, the slave is tempted with murder and violence against his oppressors as he recalls all the joys that he lost because of slavery. 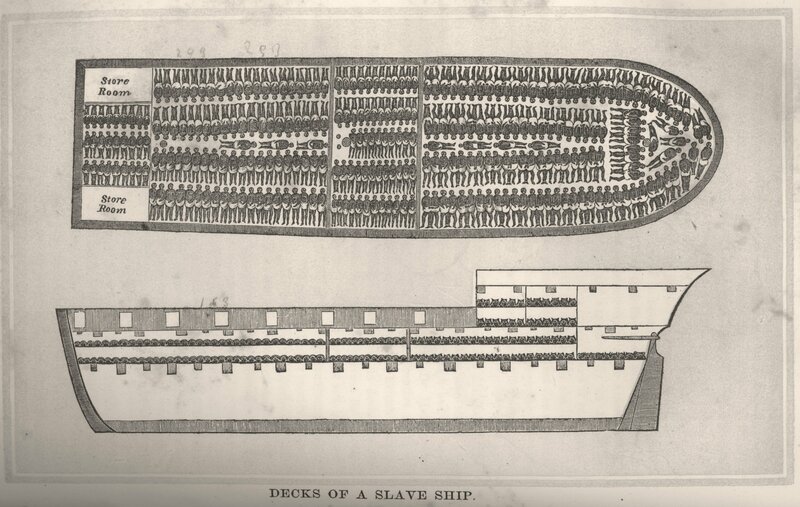 These lines describe the slave's tortured thoughts of his homeland and family, which were so cruelly taken from him. The slave knows that he should be among his people, celebrating their life and traditions along the Niger river. This sonnet aims to show the slaves as human, and by reflecting on the loss of his culture, home and people, Southy hopes to draw sympothy out of his readers. Southy takes it a step further by describing the slaves family, left alone to fend for themselves, not knowing what happened to their husband. And to the deaf sea pour thy frantic cries? Works Cited "The Middle Passage." Recovered Histories. Anti- Slavery, n.d. Web. 25 Sept. 2015. While that inhuman trader lifts on high The mangling scourge. Oh ye who at your ease Sip the blood-sweeten'd beverage! scourge: A whip, lash. Now only rhetorical, with reference to the torturing of human beings, or to ascetic discipline. In these lines, Robert Southey illustrates the brutality experienced by slaves during the time of the Slave Trade. By describing the slave trader as inhuman and coupling that with the imagery of him lifting a whip, it creates the idea that this slave trader is monstrous. Additionally, Southey compares the bloodshed during the Slave Trade as a beverage that the traders sip. In other words, he is referring to the benefits reaped by the traders whenever they force innocent people into slavery. The dark imagery of the slave traders essentially drinking the blood of the slaves is very sinister and attempts to show the inhumanity and cruelty that these slave traders were exemplary of. "scourge, n." OED Online. Oxford University Press, September 2015. Web. 24 September 2015.
spectre: An apparition, phantom, or ghost, esp. one of a terrifying nature or aspect. In this context, Freedom is taking the form of an apparition, or ghost, that is lingering around the slave's bed. The ghost of Freedom is almost taunting slavery, as the slave is bound in chains. The fact that the ghost is pale could also signify that the white man enjoyed freedom while the black man was bound in chains. "spectre, n." OED Online. Oxford University Press, September 2015. Web. 21 September 2015. In this line Nigers refers to the Niger river, which is located in the western part of Africa. In Africa, the only two rivers that are longer than the Niger are the Nile and Congo rivers. In the Oxford English Dictionary, the word tainted is defined as "Stained, tinged; contaminated, infected, corrupted; touched with putrefaction or incipient decay; affected with some corrupting influence." This simple, yet profound line of poetry refers to the Niger river being tainted or contaminated with the blood of the victims of the English slave trade. Mabogunje, Akinlawon. "Niger River | River, Africa." Encyclopedia Britannica Online. Encyclopedia Britannica. Web. 18 Sept. 2015. “tainted, adj.” The Oxford English Dictionary. 2015. OED Online. Oxford University Press. 18 September 2015. The crystal Cabinet symbolism. The line I focus on from the Crystal cabinet is after the narrator is released from the cabinet, and "Like a weeping babe became." This was symbol of him being reborn out of the crystal cabinet. He was free at the beginning and then he was captured. Inside the cabinet was a whole other world that he came to enjoy, only to be let out of the cabinet back to where he came. He can now see and feel the nature and the reality around him, continuing to weep. The fifth sonnet in Poems on the Slave trade. This sonnet is the most helpful in the poem in terms of putting the reality of the situation forward. The narrator asks if the laves should take up the sword of revenge against their oppressors and "Drove into the cold bosom of his tyrant lord". He goes on to say that nobody would blame the slaves for doing such a thing because of the terrible ways they were treated. The narrator then goes on to discuss the opportunity at great lives that these slaves one had, but had now been taken away by these "tyrant lords". This is why I thought the fifth sonnet was the most useful, because it showed how people would naturally react in the situation that these people were placed into. Citadels of light in a Summer Evening's Meditation. I looked up citadel, and it is a French word meaning, A stronghold or fortified area within a city or town, typically occupying a dominating position, and serving to protect or guard it. This means that there is a country full of great things in France, but they are being oppressed by the British. Barbauld is once again sympathizing with he French people. They could be great if it wasn't for such oppression. Surrey is a British county, known for it's forested and picturesque areas. But what is a bower? Referring to the Oxford English Dictionary, there are two definitions that are the most likely interpretations. A place closed in by the branches of trees or other plants; a shady place 2a. An inner apartment, a bed-room. 2b. Especially applied to a lady's private apartment. This "Surrey Bower" could be either a shady meeting place out in the forests of Surrey or be The Maiden's dwelling located within Surrey. In both cases this would be where the narrator visits The Maiden. However, it is possible that these two places are the same, where again it is The Maiden's dwelling but it is like a summer home or cottage hidden out in the shade of the forest. This bit of wordplay allows for very deep imaginary connecting the romantic to nature, the secluded forests of the British countryside. Take a look with Google Maps to see what Blake is referencing. "bower, n." OED Online. Oxford University Press, 2015. Web. 24 Sept. 2015. This line shares a theme of revelation along with it's partnered lines in the third stanza, but also exemplifies the theme of the cabinet in deep metaphor. The theme of revelation in this stanza shows how the narrator, due to his interactions with the maiden mentioned prior, gains a new interpretation of the world he lives in. This new interpretation starts broad then narrows down using England imagery that exemplifies specific constructs. This narrowing begins within this line with the example being the man made portion, London and London Tower (refer to part 2). Then in contrast, the natural images; the Thames, the hills, the Surrey bower (which end the stanza over the next two lines. This line is a direct connection between the revelation and the cabinet theme. It is mentioned that the cabinet is formed of gold, pearl, and crystal. This can have multiple meanings; the cabinet is created from, was paid for with, or contains said materials. Looking into the "new London" part of the line, we see that the narrator sees the city as more then a city. Look at London Tower, a place that is just like the cabinet in all three ways. It was built to be white and pearly, adorned with gold, and have massive windows. The castle was paid for with riches, and it also holds riches within. So this is what the narrator is now seeing, all the ways something can hold more then one feeling or meaning as well as be a "cabinet" of its own. "Discover 1000 Years of History." Official Tower Of London Tickets, Events & History. Historic Royal Palaces, 2015. Web. 21 Sept. 2015. "Sweet Mary" is rumored to refer to Mary Wollstonecraft. She lived from 1759-1797. She was a moral and political theorist who focused a lot of her attention on women in modern society. She had a connection with William Blake. "In 1787, she also began, but never completed, The Cave of Fancy. A Tale. The same year, she wrote Original Stories from Real Life; with Conversations, calculated to Regulate the Affections, and Form the Mind to Truth and Goodness (1788); it appeared in two other London editions in her life time (1791 and 1796), the last of which illustrated by William Blake." (Sylvana). I wonder if there was more to their relationship than just working together? Tomaselli, Sylvana. "Mary Wollstonecraft." Stanford University. Stanford University, 16 Apr. 2008. Web. 24 Sept. 2015. http://plato.stanford.edu/entries/wollstonecraft/. This imagery suggests the biblical crucifixion as well as ancient sacrificial rites practiced by the Mayans. Blake illustrates the reciprocal, emotional violence, and power mongering of human relationships in an emotional, mystical context. Means a glance, glimpse, blink, look. By using this word specifically instead of saying 'look' or another more common synonym, Blake emphasizes the infatuation the narrator feels for Mary. It portrays her as a young modest girl who wouldn't dream of being the center of attention. this word choice adds to how she is previously described and reinforces that innocent image to the reader. zenith: The point of the sky directly overhead; the highest point of the celestial sphere as viewed from any particular place; the upper pole of the horizon (opp. to nadir n.). Here, Barbauld is expressing that people do their best thinking in the dead of night, when one can fully focus on their ideas. She says that "wisdom mounts her zenith with the stars," which is metaphorically saying that one's wisdom is at its absolute highest point during the night. "zenith, n." OED Online. Oxford University Press, September 2015. Web. 24 September 2015. Barbauld's inclusion of this reference to the Hesperides creates a mystical atmosphere in terms of describing the sunset and closure of the day. Her many references to other mythological figures also accomplish this. "Hesperides, the." Bloomsbury Dictionary of Myth. Kenneth McLeish. London: Bloomsbury, 1996. Credo Reference. Web. 24 Sep 2015. "Hesperides." Who's Who in Classical Mythology, Routledge. Michael Grant and John Hazel. London: Routledge, 2002. Credo Reference. Web. 24 Sep 2015. An allusion to Satan in reference to the weather. The infernal heat of the day has subsided to the coolness of twilight. The poem's first shift of time. During this whole poem, Barbauld is referencing many different divinities from many different cultures as well as many different references to the solar system. In this particular part of the poem, Barbauld is talking about an embryo system and unkindled suns. She is referencing to stars that have not been born yet within the solar system. When thinking about that, she can then think about how there may be an embryo God within herself that has not been born yet. She has a divine, unborn spirit inside of her that she hasn't found yet. However, once she enters these types of thoughts, she forces herself to take a step back. She has realized that her meditation has possibly gone too far. God is divine, and we maybe shouldn't be thinking about such divine figures within ourselves. The Egyptian hieroglyphic is an ancient type of pictographic language. While other styles of picture-based writing exist in the world (including parts of Asia and Mexico), Barbauld references the Nile, a river running through northeast Africa. This ties the reference specifically to Egypt. Hieroglyphics first appeared around 3110 to 2884 B.C. While the roughly 604-symbol language is almost entirely understood now, it was not translated when Barbauld wrote this poem in 1773. Barbauld references a, “master… whose hand with hieroglyphics older than the Nile,” referring to a creator being who wields a language even older than the ancient Egyptian’s then-yet-deciphered one. Interestingly, the Rosetta Stone was discovered in 1799, just 26 years after this poem was written. The Rosetta Stone provided Egyptologists Jean-Francois Champollion and Thomas Young with the key to deciphering the Egyptian hieroglyphic. "Hieroglyphic." The Columbia Encyclopedia. Columbia University and Paul Lagasse. New York: Columbia University Press, 2015. Credo Reference. Web. 23 Sep 2015. "Rosetta." The Columbia Encyclopedia. Columbia University and Paul Lagasse. New York: Columbia University Press, 2015. Credo Reference. Web. 23 Sep 2015. Impatient for the night, and seems to push Her brother down the sky. referring to Diana's twin Apollo, also known as a sun god who rides his chariot across the sky to bring light and daytime. Barbauld uses the roman references not only whimsically to further illustrate the calming, mystical, and almost other-worldly feel of the poem but also as a transition of time to move the poem gracefully into the time of meditation where things like Gods and how the universe really works can be contemplated without the distractions of the day. This actually refers to Diana's crescent. Diana is the goddess of the moon, hunt, and childbirth. This reference is from Roman mythology. One of the many types of mythological figures from many countries that are referred to in this poem! This is my course website, and home of my class webpages. Yay.